Now you can add an upper level to a single-level covered C&C cage! Set on our Cagetopia Wonder Bars, Patios are easily raised or lowered allowing young or older guinea pigs to enjoy exploring an upper level on a ramp with a gentler slope. Also great for all guinea pigs new to upper levels. Our Patios are designed to fit within a closed C&C cage with enough clearance for the guinea pigs on both the patio level and the main level underneath as well as an open cage with optional safety grids or windows around the patio perimeter. Just lift the patio for easy cleaning access! Patios are shipped with all four sides intact, allowing you to choose where you want the ramp entrance located--you just make a simple cut wherever you'd like--left, right, or in the center. Our PARTY size patio is designed to fit inside a 2x4 grid cage OR LARGER. The cage itself is NOT included. Bars pass through the grid squares, so if you have a 12" back wall on your cage base, you'll need to cut that section down. Images may show the patio with a cage, canopy, cafe, and/or cover, but are not included. Be SURE to click on the "What's Included" tab for patio components. The half grids and half windows can be selected as an option. Easy Lift-Off for Cleaning and Access Below! Our Patios are only possible because of our EXCLUSIVE, custom-manufactured Wonder Bars! The patio rests on a pair of very strong 1" x 29" steel powder-coated bars. Just lift off the patio and easily pick up the two Wonder Bars for 100% access to the cage below. You can raise or lower the patio to make the ramp slope gentler, making it easier for very young or older piggies to navigate, as well as guinea pigs new to upper levels. Just change where you place the bars to raise or lower the height as necessary. Choose one of our patterns and cut a wave or castle for a fun look on the front edge of your patio. Email sue@guineapigcages.com for PDF. Our PARTY Patio is 20.5 x 28 inches. Please note that the width is 28 inches, not 27 inches or less. This is because the patios are mid-grid height where there's no connectors. As a result the width of the patio is slightly wider than the base for a better fit. A potential Kitchen or Hay area separate from the main cage area. But please note, not all guinea pigs will want to use this. Ideally, it's better to locate the kitchen under the patio or loft. Older guinea pigs may lose interest in going up a ramp to an upper level. Some are unable as arthritis can bother guinea pigs, just like it can people. The gentler the slope of the ramp, the better, but less slope also takes up more precious downstairs cage space, so it's a trade-off. Please keep in mind that you should only count the lower level when determining required cage space for your guinea pigs. Upper levels DO NOT COUNT in determining how much space you are providing. Upper levels are used occasionally and sometimes not at all by some guinea pigs. 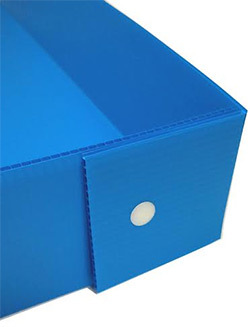 (1) 4mm 20.5" x 28" x 3.75" wall Coroplast base in your choice of 16 colors! The patio base is cut and scored so you only have to secure the flaps and cut your ramp entrance. (1) 27" Reinforced Ramp in your choice of 16 colors with edging to match your grid color. (2) Wonder Bars in your choice of black or white to match your grid color. (2) Velcro strips to secure the ramp to the Wonder bar allowing it to stay put when lifting the patio.